...you have to work more for less, and you don't have time to find better work. When you're really busy meeting demand for under-priced services, you don't have time for strategic marketing. Not having time for strategic marketing means you're right back where you started – needing to pick up any work just to meet required sales. Welcome to the endless cycle of barely keeping your head above water! You don't need more work. 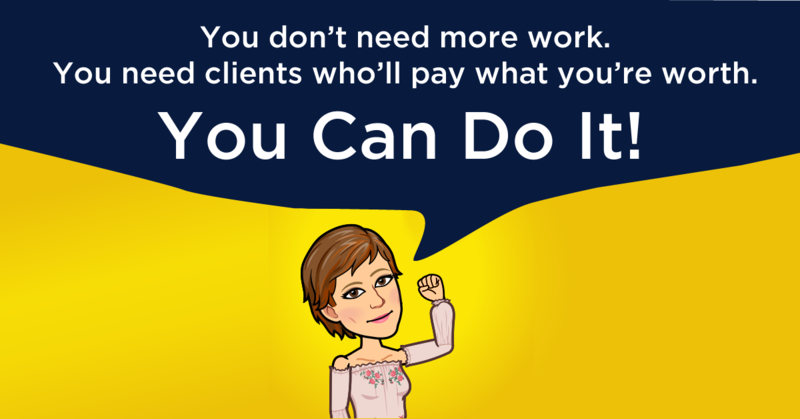 You need clients who will pay what you're worth. By focusing on strategic marketing, you'll spend your time targeting the clients who are the best fit for you – those most likely to value your expertise and most likely to be able to pay the prices you deserve. This is the most sustainable way that a service business owner can increase sales and profits. After all, the world is filled with business owners who work many long hours to barely keep their heads above water. They see getting more work as the only way they can increase sales, but they have no more hours in the day! When you follow through on marketing strategically to land the right clients and the right projects, you'll find yourself working less and making more. Then, as you begin to book work out in advance, it frees you up to increase your prices for new clients. Raising your prices by 10% each time you're booked out for a couple of months (or whatever cashflow runway you need to maintain) will result in you getting increasingly better clients over time until you reach the point of equilibrium – where you're truly charging what you're worth. The end result of strategic marketing? You'll either be working the same amount of time for much more money, or working less and having more free time. Either way, your profits increase relative to the amount of time you're working. Can you imagine that feeling? No more getting up in the morning and wondering where your next sale is coming from... for many, that thought is unimaginable. You really can do it, though! If you're ready to get serious about strategy but not sure where to start, you can book a free consult with me at the bottom of this page. I'm happy to talk with you about how you can improve your business, and promise no gobbledygook!